Endless has recently developed a brake pad with charecteristics enabling it to perform well on both street and track: the new Endless Type CC-X brake pad. The Type CC-X brake pad is derived from the Endless original formula ceramic carbon metal base such as the Type CC-M brake pad, but its difference lies in the ability to perform well for a wider range of users. Its compind makes it a semi-metallic pad with non-asbestos qualities. For the street, where low temperatures are more frequent, Type CC-X performs well and causes less rotor damage than the Type CC-M and most semi-mettalic pads. 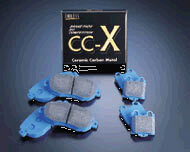 Usually, semi-metallic pads sacrifice initial response in order to perform better at higher temperatures, but the Type CC-X is able to do well at initial response. At higher temperatures, the pedal feeling responds well while maintaining controlability with a stable coefficient of friction. For the circuit, the Type CC-X brake pad can maintain its stability at rotor temperatures of 930-1250 degrees Fahrenheit. This pad may just be perfect for the amateur race driver.